Doubtless there are reasons -- the most likely is that Ka, a long novel released late in the year, was not read by enough Nebula nominators. Be that as it may -- it is a remarkable work, and the notion that it was regarded as not one of the seven best SF/Fantasy novels of 2017 by the members of SFWA is, at least, curious. I don't want to sound so grumpy -- indeed, as I said, the novels chosen for the shortlist are pretty fine. (And, indeed, it's hard for anyone to read everything good published in a given year.) But there is pretty fine and there is remarkable. The narrator finds a very sick crow in his yard, and nurses him back to health, and somehow learns to speak with the crow. He learns his name -- Dar Oakley -- and then learns his very long story. 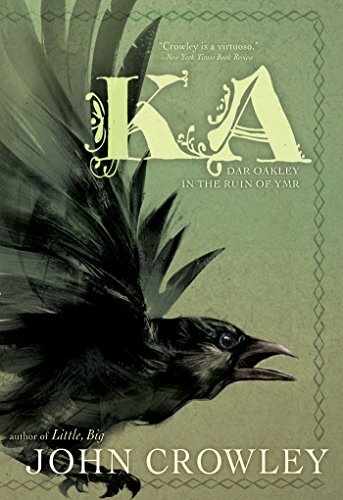 Dar Oakley is an unusual crow, obviously. He is the first crow to take a name, the first to learn to communicate with humans. The first human he has a relationship with is a girl named Fox Cap, in what seems a Neolithic culture somewhere in Europe. Fox Cap is close to the tribe's shaman, and indeed become shaman eventually. As a result of his association with her, and other humans, he learns of the human tendency to war, and of the benefit thereby accruing to crows -- carrion, dead humans. So indeed the novel is throughout involved with death, and more intimately as well, as Fox Cap and Dar Oakley journey to the land of the dead (or something like that) to steal "the most precious thing", the secret of immortality. Only Dar Oakley keeps it for himself. And so he is reborn again and again, and we hear his story as he leaps forward in time -- to a monk in the middle ages; then across the ocean to the New World, and to a Native American tribe, and one man in particular, taken captive by one tribe (war again) and adopted into them. Then forward to the Civil War, and its aftermath, and a Spiritualist woman, and then her son, who learns to hate crows, and then finally to the time of the narrator, in our near future. Throughout we learn of war, and death, and what may come after death. Dar Oakley makes several journeys to various versions of the land of the dead. He also has numerous crow families, and we meet some of his fellow crows and his mates, particuarly one called Kits, who it turns out is a special crow as well. "Only the living can travel there from here, cross the river, see and speak to those they know or know of, take away its treasures. The living create the Land of Death and its inhabitants by going there, and returning with a tale. But dead People can't be there, can't go there or anywhere: they're dead."